XH558 was the last Vulcan to leave the RAF service, flying on from 1986 to 1993 as the single RAF Display Vulcan, a career of 33 years. Her final flight was on 23rd March 1993 to Buntingthorpe Aerodrome in Leicestershire, having been sold off by the Ministry of Defence. In 1997, a small team headed by Dr Robert Pleming started to put together an audacious plan to return her to flight, but it was clear from the start that the project would be technically challenging & enormously expensive. Never deterred, the team set off down the path that led to XH558's return to the air. Finally, 14 years after its last service flight and with over £7 million spent, Vulcan XH558 roared into the air again on Thursday 18th October 2007, a perfect day for flying. 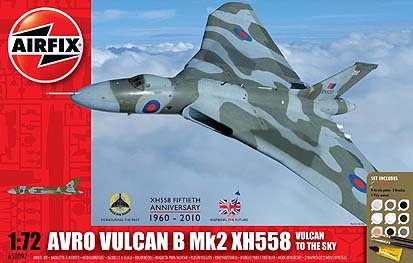 An unforgettable day for the Vulcan to the Sky team.